What would it take for MIT to stabilize its overall carbon emissions despite projected growth in the Kendall Square area? Could MIT in the long run become a “net zero” community—one in which energy consumption is balanced by renewable energy production and efficiency? MIT students tackled that question last spring—and, while they didn’t produce a definitive answer, they did get an education in the kind of work required to find one. Getting to net zero is a hot topic these days, particularly in Cambridge where in 2013 citizens petitioned to require new buildings over 25,000 square feet to generate net zero greenhouse gas emissions. But Reinhart says it’s not realistic to imagine every building can generate the power it needs with renewables. “If you look at documented net zero buildings, there are less than 400 in the whole world,” he says, noting that even a roof full of solar panels cannot meet the energy demands of a large or energy-intensive building. That’s why Reinhart, who heads MIT’s Sustainable Design Lab, is investigating the idea of a net zero community—one in which power-hungry buildings are balanced by efficiencies or green generation elsewhere in the community. In 4.433, students specifically explored whether MIT could expand its square footage without adding carbon emissions or depending on off-site green energy generation. Students initially examined the energy demands of four buildings: a lab building, a residence hall, and two office/classroom buildings. “We looked at what kinds of lighting they had, occupancy, what kinds of equipment. These are all inputs that are needed to create an energy model” of a building, says Julia Sokol, graduate student in mechanical engineering. “We did the calculation to see what area of PV [photovoltaic] panel you would need to meet the [energy] demand of a specific building,” says Nathaniel Jones, a building technology graduate student. Students found the lab building was the neediest, requiring nearly six football fields of PVs to meet its energy demands, Jones says. 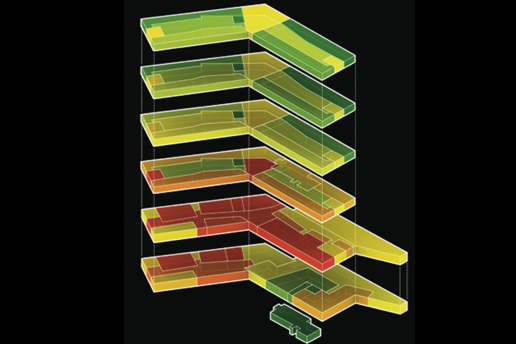 The students next estimated each building’s energy usage with “umi,” a tool developed at the Sustainable Design Lab that links 3-dimensional building geometry with energy modeling. By comparing these estimates with actual usage and adjusting the models for accuracy, they extrapolated the likely usage for all MIT buildings. This enabled them to create a model of campus energy use, which they employed to explore energy performance in a variety of ways. For example, they simulated changing all single-pane windows to double pane, adding more insulation to walls, improving lighting, and adding daylighting sensors. “The class was a nice way to get some data into these discussions,” Reinhart says.